Are you planning a party for the Super Bowl or are you looking forward to a relaxing night in with your family cheering on your favorite team? No matter what your plans for the Super Bowl, Momento Pizzeria & Restaurant has the right take-out option for you. Chef Nicola Mersini personally created a menu of carry out and delivery Super Bowl party options which feature traditional football food favorites such as pizza, wings, baked ziti, mozzarella sticks, fries, soda, and so much more. Even more exciting, these special Super Bowl carry out and take out options are offered at a substantial discount that is only available for the Super Bowl. 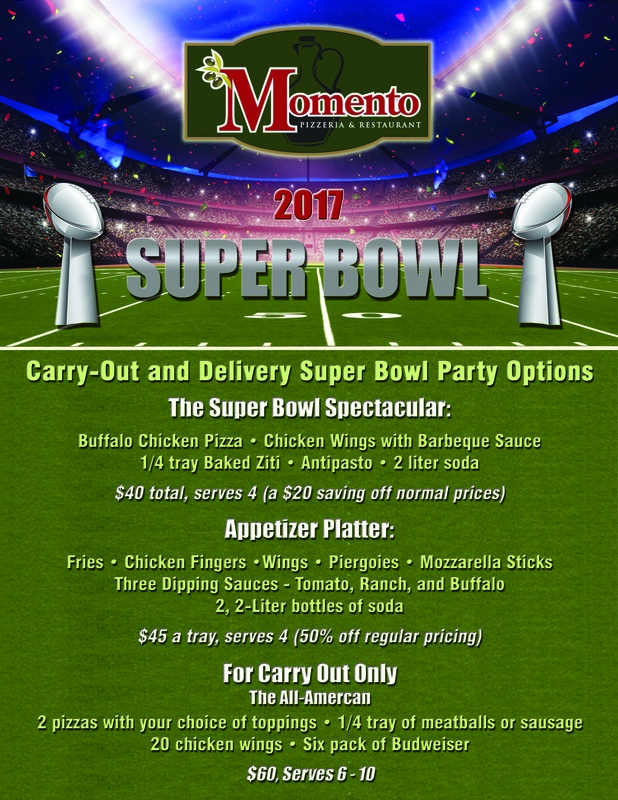 Call 570-422-1040 to speak with a Momento Pizzeria and Restaurant staff member and confirm your order for a Super Bowl party platter. Have a special catering request for the Super Bowl? Chef Nicola is happy to help create a custom order that meets the needs of your Super Bowl party. Call for details.